April is here. The weather warms, days lengthen, plants sprout, and birds arrive. 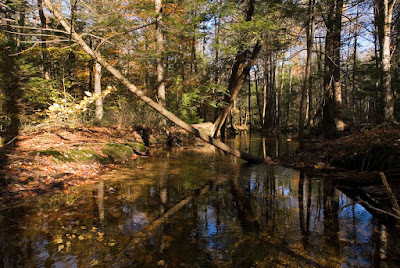 Earth Day, April 22nd, is a day to celebrate one of my favorite stretches of the Farmington Canal Heritage Trail, the roughly three and one quarter miles running through wetlands and farmland from Copper Hill Road in East Granby CT to Congamond Road in Southwick MA. Like most of the trail's entire route from New Haven to Northampton, it's accessible to almost anyone who wants to be outdoors enjoying nature without having to hike through fields, forests, and marshes. In step with the countless walkers, joggers, cyclists, and dogs pulling their masters, you can find folks using walkers, pushing baby strollers, and motoring in wheel chairs along this comfortable, level pathway. The trail's accessibility to people from all walks of life is a celebration itself. So for anyone who wants to be outdoors enjoying nature, especially birding like I do, the trail has much to offer. While its path is different from the terrain of nearby hills, woods, and swamps I often hike, the trail provides excellent opportunities to exercise, socialize, and bird watch all at once. For the better part of the past two decades I've walked, run, and cycled along many miles of the treasured Farmington Canal Heritage Trail, however it's only the past few that I've spent countless hours on it observing and photographing birds, especially on the East Granby to Southwick section. I owe much of my new found hobby to my friend Chris Fisher, an expert nature photographer of distinction from East Granby who travels the trail, too. He's coached me on camera selection, and more importantly on techniques to improve my photography skills. Check out Chris's website at Natural Expressions Photography to learn more about him and his nature photography exhibitions. In March bird activity along the trail picks up and lasts through most of the fall. Some birds are year-rounders, some are flying in during the spring to nest and raise their next generation, while others are passing through en route to breeding grounds farther north, and then passing through again in early fall southbound for their winter home. To capture the essence of what the trail's accessibility can yield for birders, I've created several collages of bird photos I've taken without having stepped off the path, not even an inch. Certainly, there were many days (the majority, in fact), when I saw nothing of note and left without any pictures. Often it's when the trail is busy with foot and cycle traffic that birds keep their distance, but when I have successfully photographed a particular bird, I've reaped the rewards of persistence, patience, and calculated timing that are the keys to what it takes to be in the right spot at the right time to photograph nature in the wild. Clockwise from top left are a Palm Warbler, Yellow-rumped Warbler, and a Common Yellowthroat Warbler photographed soon after arriving in April and May along the wetlands nearing the CT-MA border between mileposts 21.6 and 22.0. In this collage Eastern Bluebirds are making sure their chicks are well fed in the Bluebird house near milepost 21.0 in Suffield CT. I first photographed this couple as they were building their nest, and then later as they were feeding their brood. Unfortunately, I was not present when their young fledged, though I visited nearly every day. It happens quickly, and timing and chance are everything. Clockwise from top left are a Cedar Waxwing, Gray Catbird, Red-winged Blackbird, and Eastern Towhee. The Cedar Waxwing was photographed along farmland near milepost 21.0 in Suffield; the Gray Catbird was photographed in the trees along wetlands between mileposts 21.6 and 22.0; the Red-winged Blackbird in the marsh just north of milepost 20.0; and the Eastern Towhee near milepost 22.5 in Southwick. These Eastern Phoebes arrived in mid-March in Suffield near the bridge at milepost 22.0 at the CT-MA border. They are among the earliest spring arrivals as they migrate to breed in this area. Late last summer for two days in a row I was fortunate to observe this Great Blue Heron fishing in the swamp between mileposts 21.6 and 22.0 in Suffield. On the day I captured these photos, I patiently leaned against a trail fence for almost an hour with my camera focused and ready for the heron to strike. When it did, I clicked away in rapid fire bursts capturing the action of a successful catch. Spring is mating season. These three couples were sharing the same stream one morning north of milepost 21.6 and just past Mountain Brook bridge. Clockwise from the upper left are Canada Geese, Mallards, and Common Mergansers. In this final collage are, clockwise from the top left, a male Wood Duck, A male Mallard, and a Mallard couple with their ducklings. The Wood Duck and Mallard were in the stream near milepost 22.0 at the CT-MA border; and the Mallard couple were in a vernal pool just north of the trail's entrance at Copper Hill Road in East Granby. I've seen many other birds along the trail during the years I've been walking it. They include birds that typically gather around my home feeders, or nest in the trees in my yard such as Eastern Cardinals, Eastern Mockingbirds, Black-capped Chickadees, Tufted Titmice, Carolina Wrens, House Finches, and Blue Jays, among many others. Also, I've seen Red-tailed Hawks, Cooper's Hawks, Northern Flickers, and Downy, Red-bellied, and Pileated woodpeckers. Clearly, many species of birds may be seen simply by venturing up and down the highly accessible stretch of the Farmington Canal Heritage Trail from East Granby to Southwick. Beyond being able to walk among the birds that thrive in this habitat, what makes this section of the trail priceless is that's it's made for anyone and everyone to enjoy, and that's cause for an Earth Day celebration! 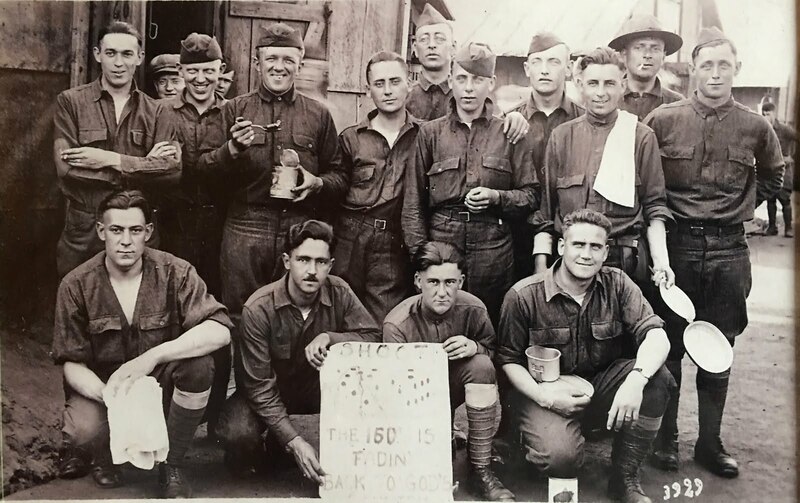 "For African-American travelers in the Jim Crow-era South—often journeying from the north to visit relatives who had not joined the Great Migration—an unprepossessing paper-bound travel guide often amounted to a survival kit. 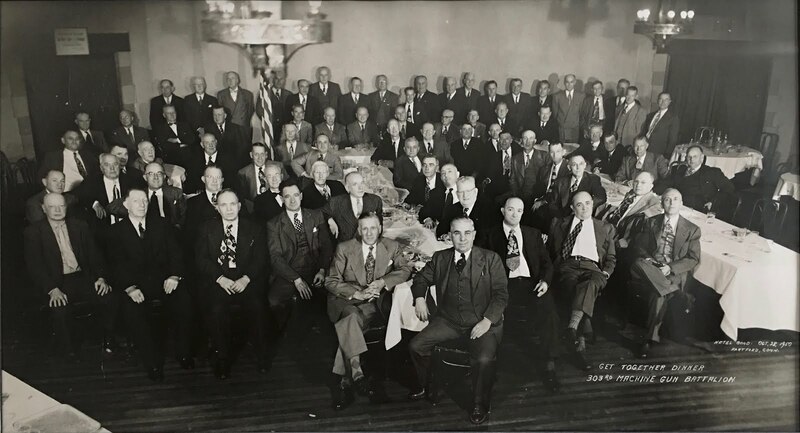 The Green Book often functioned as a lifesaver," writes Kathleen Burke of the Smithsonian. The recently released movie Green Book, which opened to much acclaim, depicts a historically relevant tale based on one family's recounting of a story that reconciles the racial divide between two very different people, people who ultimately recognize the common, race transcending humanity that ties them together. While the movie is worthy of its accolades, and offers an important view into America's history of racism, its references to the real Green Book provide scant insight into the book's importance as a once vital African-American travel guide for navigating the country safely. Even traveling with his white bodyguard, Don Shirley, the world renown classical and jazz pianist depicted in the movie, couldn't be guaranteed protection from the violent racist reality of the time. Deeper digging is required to discover the Green Book's true historical significance, and how it links to today's reality. 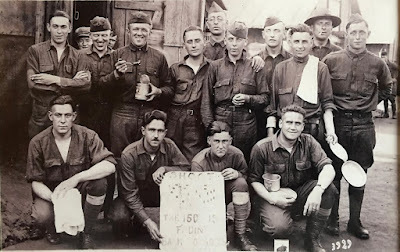 In early 2016, especially in February during Black History Month, I prefaced a few of my posts with the words "Essential American History." One of them was about the Green Book. 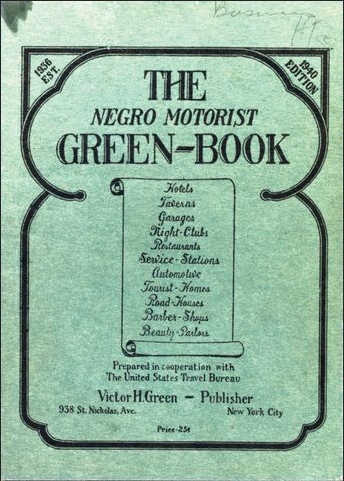 Learning about the Green Book is to begin to understand how heartbreakingly difficult it was for many Americans to navigate a segregated nation. It is one more story in the countless many about racism that are critical to our understanding why it is no simple task to bring people together in trust and harmony given what we've done to each other. Without awareness of history's details and context we miss points that may make a significant difference in how we relate to each other; how we welcome or exclude each other; and how we enact laws and promote behaviors that either treat everyone fairly, with dignity and justice, or discriminate against certain people leading to unfair treatment, degrading and devoid of the justice our country promises to all Americans. The Green Book's Black History, Brent Staples' opinion piece that recounts "lessons from the Jim Crow-era travel guide for African American elites," along with The Smithsonian and PBS stories listed below, documents the Green Book's importance and relevance in American history. They are well worth reading to gain another much needed view into the cruel and demeaning realities created and sustained by white America. Further details, as well as links to Green Book copies, can be found in a 2013 PBS story "Green Book" Helped Keep African Americans Safe on the Road. 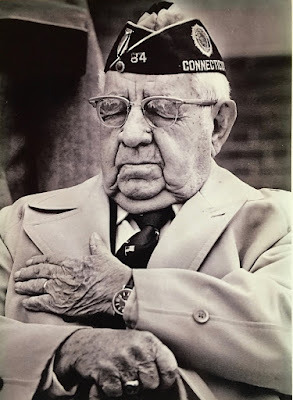 This blogpost was published in The Connecticut Mirror's CT Viewpoints on February 13, 2019. 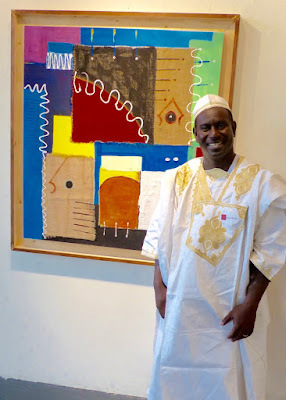 Georges Annan Kingsley with one of his art works displayed at an Asylum Hill art show. On Saturday, October 20, 2018, Georges Annan Kingsley awoke to a new life. Georges received his long awaited kidney transplant the night before. A perfect match, his new kidney worked immediately. This perfect match was on top of another successful transplant just twenty-three days earlier. 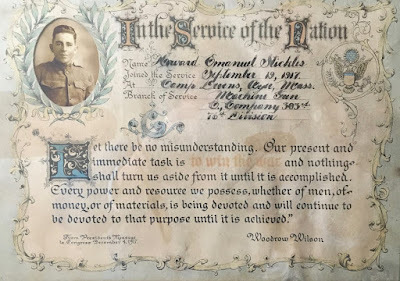 On September 27, 2018, the United States welcomed Georges as a new citizen. It's a blessing for Georges and his family. It's a blessing for the greater Hartford community. It's a perfect match. All who know Georges love him, his wife Asse Marthe Ntchohou, and his son, Joe-William. A well respected resident of Hartford's Asylum Hill Neighborhood, Georges is a community leader. He's an accomplished artist (he has a painting on display in the White House), a teacher, and a radio host, as well as an Asylum Hill community organizer championing the acceptance and well being of refugees and immigrants. Despite being tethered to exhausting dialysis sessions three times a week prior to his transplant, Georges' prolific production of paintings and sculptures ensured his works were always on display at local art shows. Most recently he had a two-week exhibition at Connecticut's Legislative Office Building. Incredibly he found even more strength to organize cultural celebrations, sponsor clothing drives, teach art classes, and promote job skills training for new arrivals in his welcoming Hartford neighborhood. 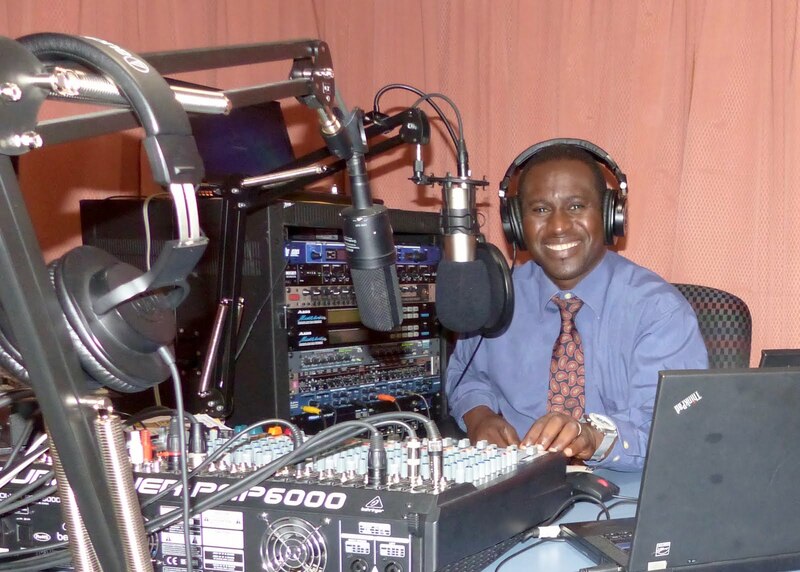 Saturdays on Ghana Beats Radio from 12:00-2:00 p.m.
George is a transplant who has taken root in Hartford successfully. His compelling stories about escaping from political persecution in Côte d'Ivoire and his quest for a kidney transplant are well documented. I've covered a bit of them in my blog posts: My Friend Needs a Kidney Transplant, and Listen to the Heartbeat of Africa in Hartford about Ghana Beats Radio, the on-line radio station he and his business partner, John Ackeifi, launched to serve the sub-Sahara African diaspora living in greater Hartford. But those posts only tell a small bit of his story. To learn more about Georges I've compiled a series of links to stories that present a more complete appreciation of this talented and compassionate man who was a model citizen long before he actually became one. His perseverance and optimism embody Connecticut's motto Qui transtulit sustinet: "He who transplanted sustains." Photos by Don Shaw, Jr.; the photo of Georges with the judge was submitted by the Georges Annan Kingsley family. 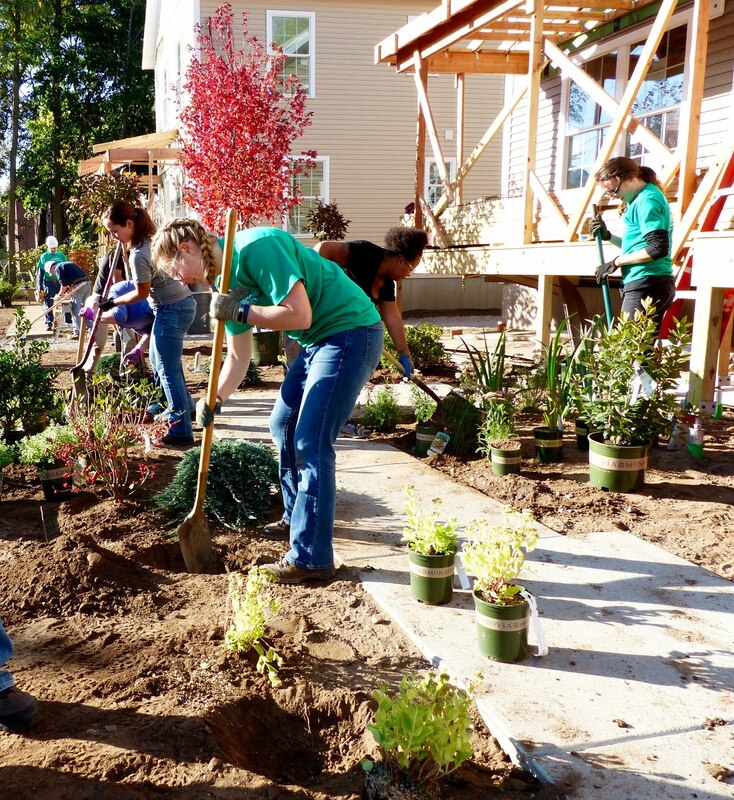 Hartford Area Habitat for Humanity is celebrating the start of its 30th year anniversary. It began with a kickoff party on October 19, 2018 at the Hartford Marriott Downtown. I interviewed Habitat homeowners Janice and Kerry Foster for the event. Here is their story. Raised in Hartford’s Stowe Village housing project, Janice and Kerry Foster lived first-hand the challenges facing their families, friends, and neighbors striving for better lives and looking for a way out of poverty housing. Throughout their school years they were close friends, eventually marrying and raising a wonderfully close-knit family. Though they lived through some tough times and a searing family tragedy, they became pillars of their Hartford neighborhood, always championing better lives for anyone in need. While Kerry was pursuing his HFD career, Janice was employed as a medical office assistant and living in substandard Northeast Neighborhood apartments, the only housing her limited income could afford. When she gave birth to her first child, her building’s infestation of mice and roaches became too much to bear. As a caring single mother struggling to make ends meet, it was a call to action. 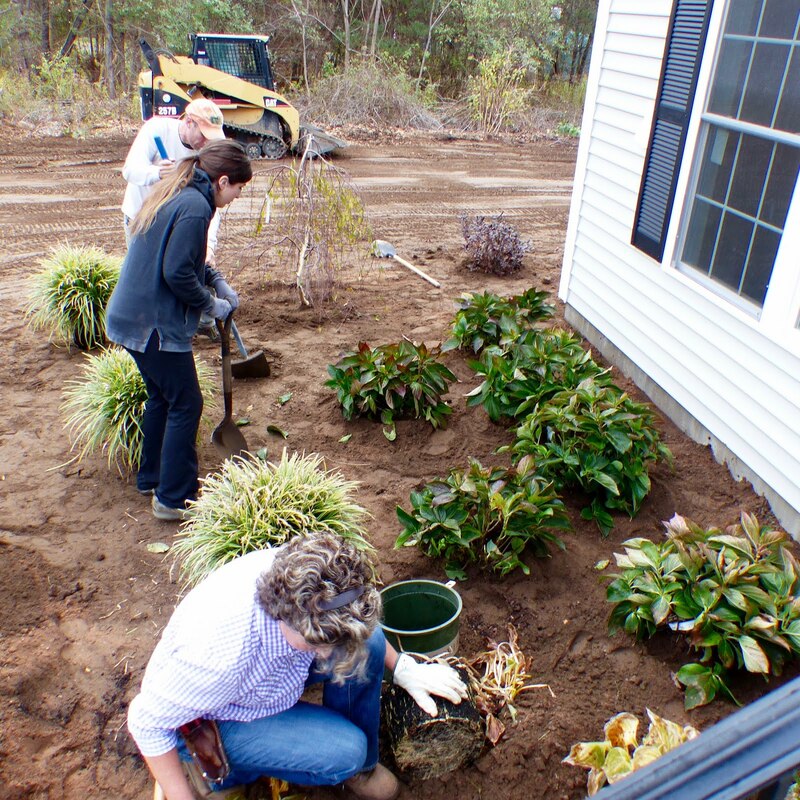 While searching for better housing, Janice heard about Hartford Habitat for Humanity. With a quick inquiry about the process to become a homeowner, Janice thought that Habitat could be the answer to her prayers. It was. When her application was accepted, Janice began her sweat equity as soon as she could under the firm but gentle guidance of former Habitat Family Services Director Steve Zwerling, and the one-on-one coaching of Ruth Puff, her Family Services partner, both of whom the Fosters regard as family. It’s been more than twenty years since Janice moved into her Habitat home. A couple of years after settling in, she and Kerry married, dedicating their lives to each other and their family. 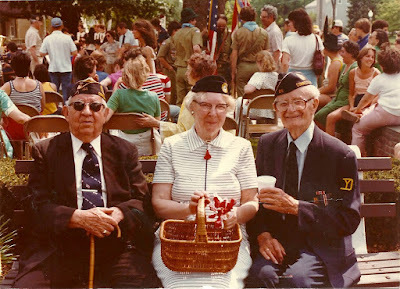 Though his successful firefighting career enabled them to live almost anywhere, Kerry emphasized that he and Janice are “anchored to the Northeast Neighborhood forever. We will never leave our 52 Clark Street home,” a home where they raised four children, and welcome visits from their four grandchildren. It was a neighborhood they loved - a neighborhood where they could channel their love of Hartford by extending their generous helping hands to ensure their neighbors in need are sheltered, clothed, educated, and fed; they are always cooking for families and big community functions often using the two barbecue smokers in their backyard. Habitat’s mission played a large part in “opening our eyes even wider to the needs of others,” said Kerry. Yet it all could have ended when they lost their son Kerry Jr., known as KJ, to a senseless random drive-by shooting on Memorial Day in 2006. 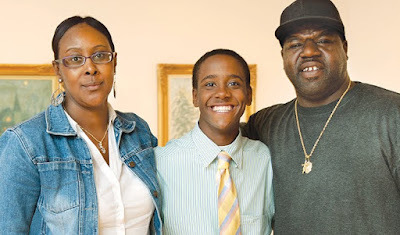 KJ was a bright, popular eighth grader simply playing in his yard when he tragically died. A visiting friend was wounded and survived. Through the strength of their faith, and to honor of the memory of their beloved son, KJ’s passing became another call to action for Janice and Kerry to give even more of their time and treasure to the community. 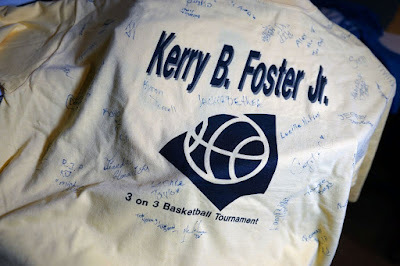 In memory of KJ they established the KJ Foster Scholarship Fund, and then they poured even more of their personal savings into setting up another scholarship, the Janice and Kerry Foster, Sr. 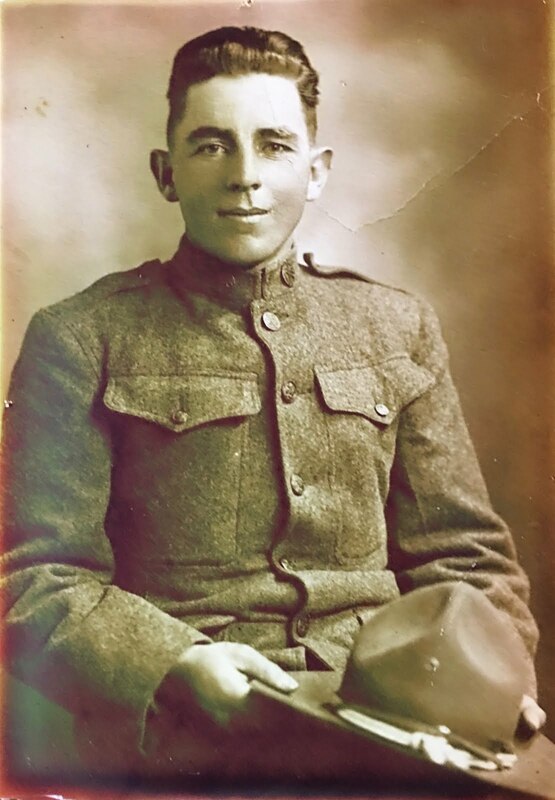 Scholarship Fund, both of which are managed by the Hartford Foundation for Public Giving. Also in memory of KJ, the Fosters sponsor a Waverly Park Little League team, and during Hartford's annual Safe Night Out event a 3-on-3 basketball tournament at the Boys and Girls Club. “Losing our son made us stronger. We’re proud to be role models and help make things happen. People need to take charge of their lives, and we’re glad to help them. You don’t always need money to do good, most of the time you just need to dedicate the time,” said Kerry. As Janice so wonderfully believes, "If you give, give from the heart -- and it's the little things that count. You have to start somewhere. It's a wonderful thing to give back. I wouldn't live my life any other way." Photos courtesy of Janice and Kerry Foster, Rich Wright Productions, and the Hartford Foundation for Public Giving. Highlighted Links are to videos and Janice Foster's quotation on the Hartford Foundation for Public Giving website. For Robin Roy Life is All About Helping Out. Hartford Area Habitat for Humanity is celebrating the start of its 30th year anniversary. It began with a kickoff party on October 19, 2018 at the Hartford Marriott Downtown. I interviewed Habitat homeowner Robin Roy for the celebration. Here is her story. In 1999, Robin was raising her two sons on her own in a small two-bedroom apartment on Manchester’s Birch Street. Her daughter was a young adult already out on her own. That’s when Robin’s rent notice arrived. Her landlord was raising her rent, which would stress her slim budget even further. But she had hope. She recently received her income tax refund. She thought that perhaps the refund coupled with some other grant could finally open the door to homeownership. 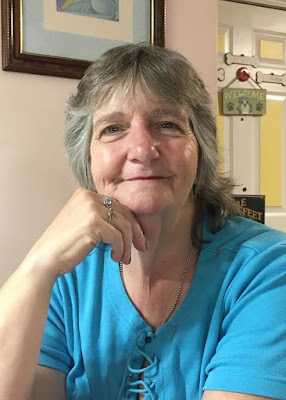 She called the Connecticut 2-1-1 Help Line for guidance on possible opportunities to pursue, but after following up she found every door locked shut despite a “pretty good credit rating,” and a regular income working in the Alstom Power company cafeteria. It simply wasn’t enough to obtain a mortgage. 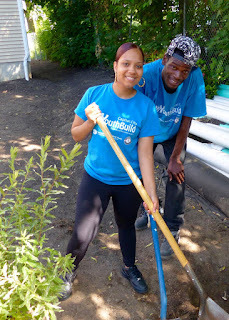 Then a chance comment by the 2-1-1 counselor led to another way – perhaps she should try Hartford Habitat for Humanity. “What’s Habitat for Humanity?” she thought. When she first heard about Habitat, Robin was a skeptic. 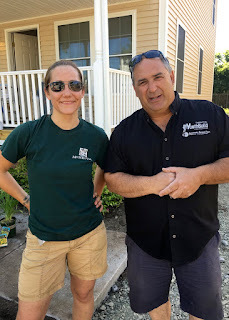 Her initial reaction was, “Is this organization for real?” But she committed to checking it out at an Applicant Information Meeting, and it was there she listened to former Family Services Director Steve Zwerling explain Habitat’s homeownership program. She learned that Habitat was planning to build three houses in Manchester, including one already under construction on Wells Street. Though she took an application, Robin wasn’t fully convinced that Habitat was “for real;” that is until she visited the Wells Street site and saw first-hand “all these guys building away as a team.” She was so inspired that she wanted to “pick up a hammer right then an there” just like she was taught growing up helping out in her father’s auto repair garage. Robin quickly completed the Habitat application and letter of interest. Where the application asked which of three towns Habitat currently would be building did she prefer, she listed “Manchester, Manchester, Manchester” to emphasize that Manchester was definitely where she wanted to stay. While she knew that if accepted Habitat made no promises as to where she might be offered an opportunity to buy a house, Robin committed to proving she was serious. She volunteered immediately to help build the next Habitat home already under construction on Bissell Street. It was winter, snowy and cold. It paid off. 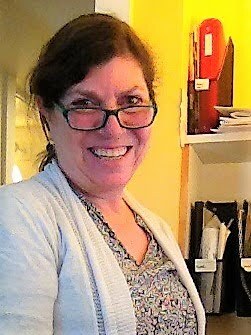 Robin was working in the cafeteria when she got “the call.” Habitat had accepted her application. 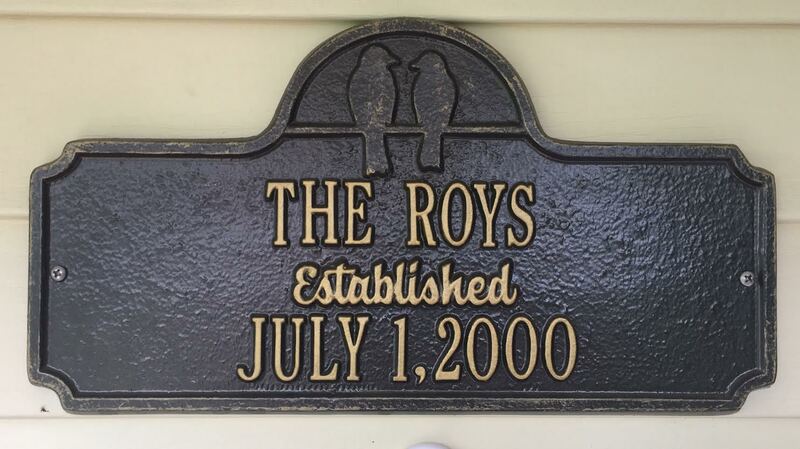 Her new home would be built on Manchester’s Foster Street. Taken completely by surprise, Robin, with her eyes welling up in tears, joyfully shouted out the good news right in front of her customers, who then followed up with cheers all around. Many cards and best wishes soon followed propelling her forward. Robin had never done carpentry, but, undeterred, she pitched in every weekend she could to help build her new home. “I cut the rails on my porch”, she said proudly as she showed off her still sturdy handiwork. “I wouldn’t have gotten a home without Habitat,” she added with the satisfaction of knowing her sweat equity helped build it. She tells everyone Habitat has always been there for her. One winter, a few years after moving in, she discovered icicles were forming in her attic. She asked Bud Moyer, a long time and beloved Habitat Saint who had worked on her house, to take a look. He determined it was because moisture wasn’t venting properly. Without a second thought, Bud voluntarily fixed the problem by installing additional soffit vents. Robin is a big believer in Habitat, and she’ll try to help anyway she can. For Robin, “Life is all about helping out.” Having a safe, affordable home stabilized her family life. It gave her time focus on raising her family, as well as herself. She eventually earned her GED, and now works for Companions & Homemakers serving people in need. It’s a natural fit and a job she loves. In two years her mortgage will be paid off, and then she can truly say, “This house is my house. It’s really mine." Monrovia team ready to plant at the West Granby Habitat for Humanity house. On a cool November 3, 2016 morning, a tractor trailer, emblazoned with the Monrovia logo, arrived promptly at 9:00 a.m. It was loaded with fresh, locally grown stock from its Granby, CT nursery ready for planting at the new Hartford Area Habitat for Humanity home in West Granby, CT. With tools in hand, a skilled Monrovia team led by Mark Hixson and Jess McCue descended on the site to dig, plant, mulch and water an expertly selected variety of plants, shrubberies, and trees in an artfully designed plan; the perfect finishing touch to the home being readied for its new owners. 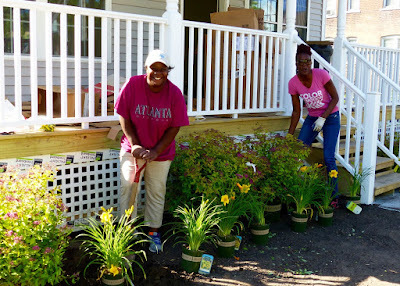 With the plantings completed by noon, the seeds for a perennial partnership had been sown. The Habitat-Monrovia partnership germinated when Mark, Monrovia's East Coast Inside Sales Coach, contacted me after reading about our Granby build on a flyer that I posted widely throughout town. Mark said Monrovia would be keen on donating plants to the local endeavor. It would even include Monrovia's design team's expertise led by Jess. The results speak for themselves. 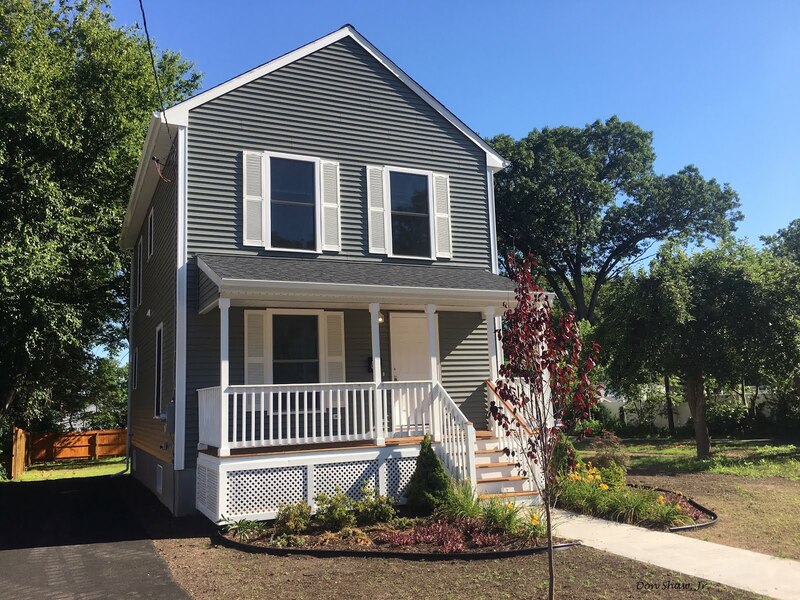 Since the Granby home, Monrovia has helped beautify twelve more Hartford Habitat homes, the latest being in 2018 on East Hartford's Bliss Street and Moore Avenue this past June. Headquartered in Azusa, California, Monrovia Plant Company is a national nursery whose trademark is Grow Beautifully®. 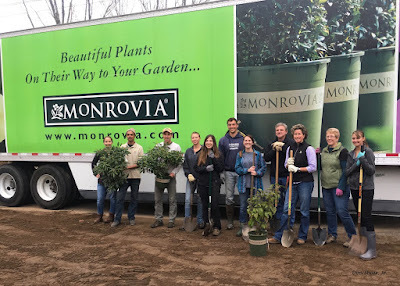 "Since 1926, Monrovia has been the nation’s leading premium consumer plant brand, led by a passion for growing the healthiest plants to enhance the beauty of American landscapes." 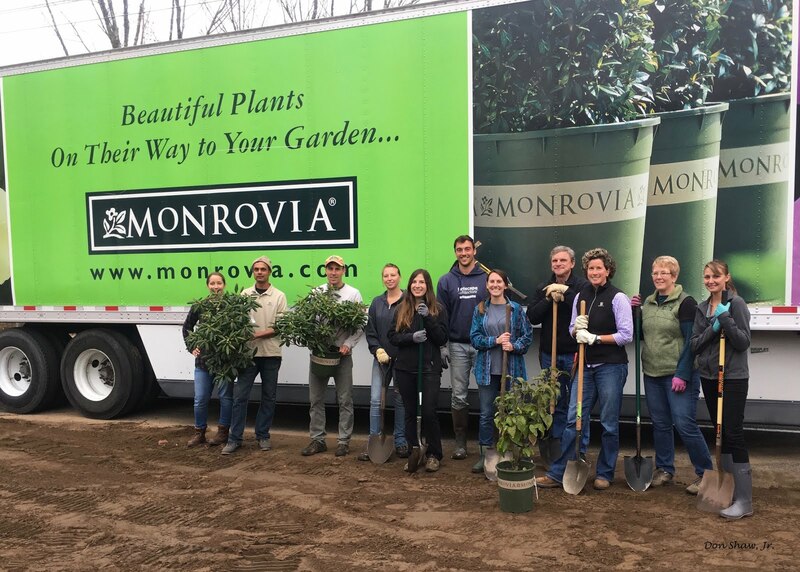 Monrovia has four growing operations: California, Georgia, Oregon and Connecticut covering the four corners of the United States. Habitat for Humanity has always emphasized the need for its homes to compliment the architectural styles and needs of the neighborhoods and communities in which it builds. House designs are adapted to ensure they support a city's long-term vision and plan of development. One aspect of that design is best described as "curb appeal," which not only considers what the house looks like, but also how it sits on its property and the landscape around it. For Hartford Habitat, Monrovia's willingness to partner is proving strategic. It's an essential element for elevating the profile of what affordable housing really is, and what it can do for a community. Not only does Hartford Habitat build new homes to create home ownership opportunities, it also rehabilitates homes in disrepair. This is especially critical as Habitat looks to work with the City of Hartford's Blight Remediation Team to eliminate blight and return properties to productive use. 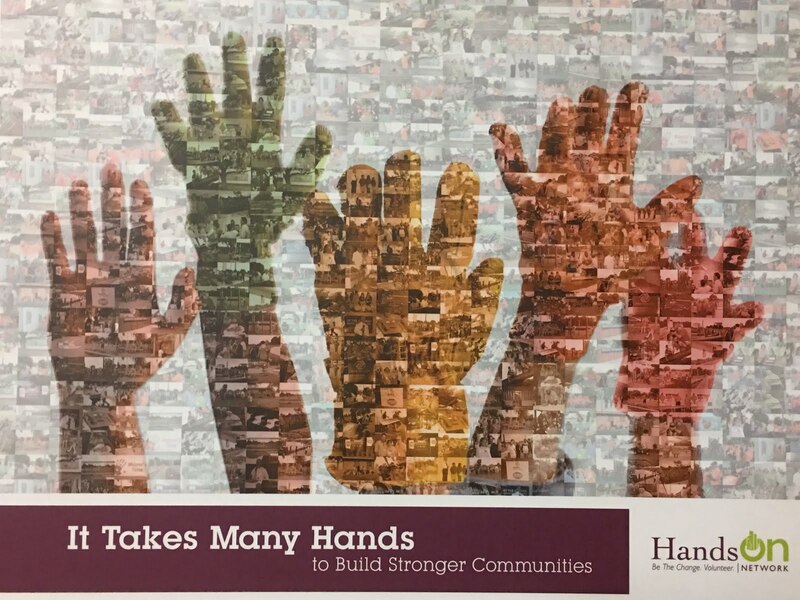 It's all part of Hartford Habitat's commitment to Habitat for Humanity International's Neighborhood Revitalization Initiative. 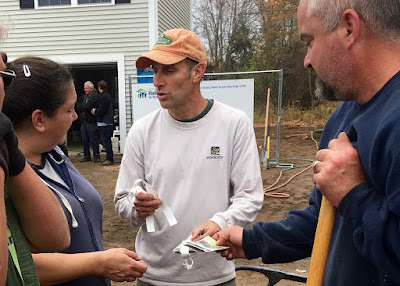 The following series of photographs and captions are representative of Monrovia's commitment to Habitat and the greater Hartford community. 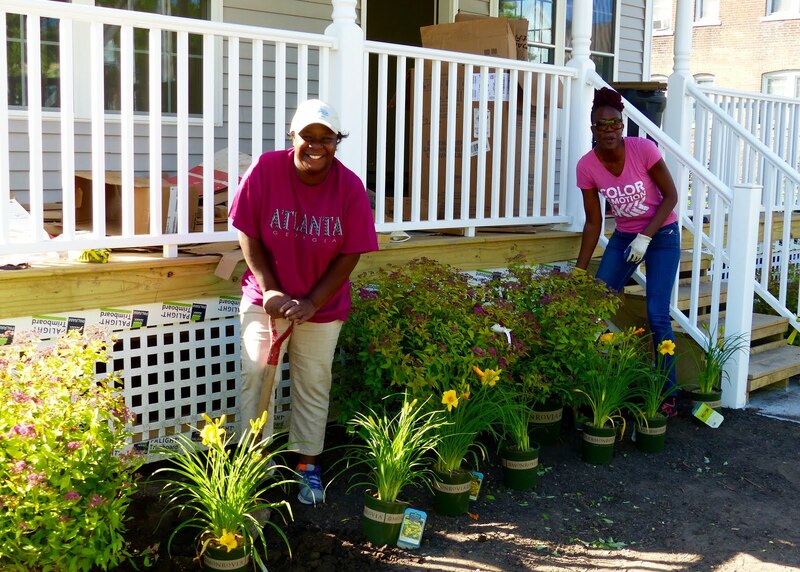 As Habitat Executive Director Karraine Moody explains, "It's a blessing to have Monrovia on board as a generous partner dedicated to improving the lives of others by sharing the natural beauty of the world that grows around us." 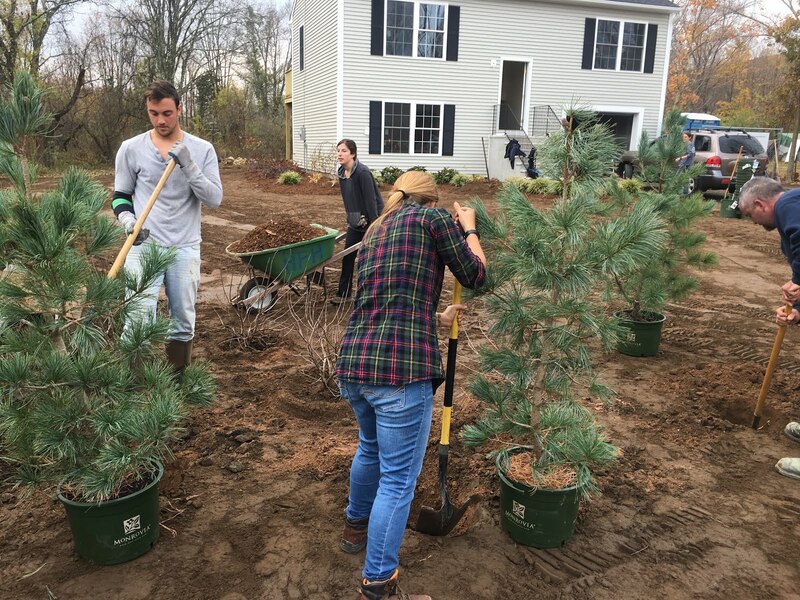 Monrovia's first endeavor in West Granby village was also Hartford Habitat's first rural build; a build much welcomed by Granby townspeople. along with a Birch tree and Lilacs bordering the driveway entrance. Carex along the foundation and front walk. Monrovia provided, as well as instructions on how best to care for them. Next it was on to Main Street in Hartford on June 14, 2017, site of three single family Habitat homes nearing completion, where Monrovia teamed up with Hartford's Capital City YouthBuild to plant shrubberies, perennials, and ornamental trees around each home. Moving plants into place takes some muscle. plants in place along the front porch. were thrilled with the results of the collaboration. all smiles after a hot day's work. On October 19 2017, Monrovia arrived on Hartford's South Marshall Street to landscape the three soon to be completed duplexes. South Marshall Street duplexes in half a day! 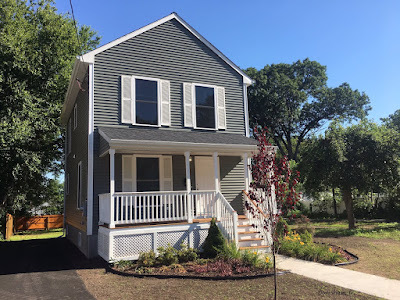 Most recently, Monrovia landscaped new homes at 66 Bliss Street and 9 Moore Avenue in East Hartford. Again, the results are excellent! As Construction Director Kris McKelvie noted, "People have been slowing down as they drive by to compliment the gorgeous gardens." And later this summer, Monrovia plans to plant similar gardens at the new Habitat homes under construction at 35 and 37 Armistice Street in New Britain. 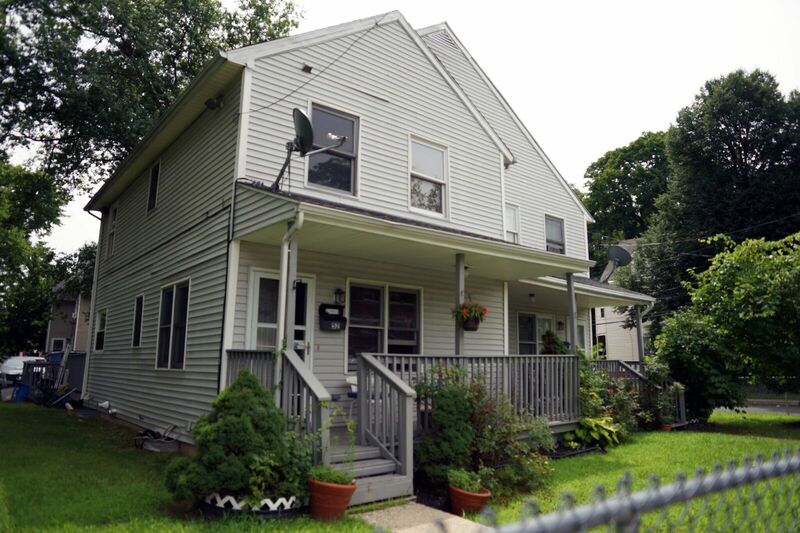 66 Bliss Street, East Hartford. The garden is thriving as the lawn begins to sprout. As of the end of 2018, Monrovia's team will have assisted on fifteen Habitat homes since November 2016, which includes the specialty walkway entrance plantings at a rehabilitated home on Hartford's Roosevelt Street. Monrovia's generosity is making a visible difference in the lives of Habitat families, and the neighborhoods where they live. 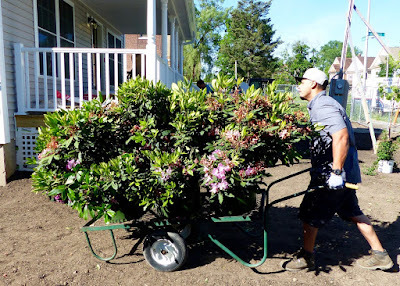 By working together Habitat and Monrovia have grown a blossoming partnership. Long may it bloom! "For the beauty of the earth, For the beauty of the skies"
Mountain Brook as it passes through Wilhelm Farm. Wilhelm Farm is typical of many small hill farms throughout New England. The 46 acre parcel of land encompasses a variety of landscapes, including open fields, forest, a woodland stream, and other wetland areas. Little of the land is level, and much of it is unsuitable for cultivating crops. Mountain Brook is a woodland stream that bisects the property. Wilhelm Farm barns and pasture in early fall. 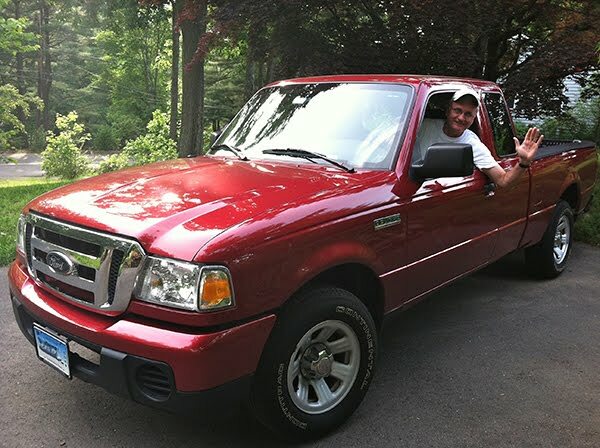 My husband and I bought the North Granby, Connecticut farm from my parents in 2003. I spent many happy hours as a child playing in the woods and splashing in Mountain Brook, with siblings, cousins, or friends. 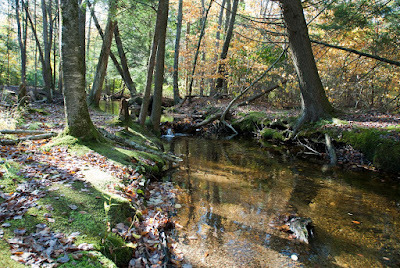 The brook actually flows from south to north, running into the East Branch of Salmon Brook near the North Granby Post Office. The land rises steeply on the west side of the brook, marking the first uplift of the Berkshire Mountains. The brook is fed by many intermittent streams that run down the mountainside in wet seasons and heavy rain events. In the spring, one can find Skunk Cabbage, Trillium, Trout Lily, Wood Anemones, and many other woodland flowers along its banks. Songbirds, woodpeckers, brook trout, frogs, turtles, salamanders, and even an occasional otter have been seen in the brook or the wetlands that surround it. The banks and sandbars are pocked with the tracks of woodland creatures who come there to drink. I frequently hike to the brook at dusk. The tranquility of this spot restores in me a sense of calm and peace after a day spent behind a desk and then a long commute home. Mountain Brook with its vivid mossy green banks and sparkling clear water. A beautiful fall triptych of colorful trees on Wilhelm Farm. On such a walk on an evening last summer, I found the stream running with cloudy, discolored water. There had been several powerful thunderstorms in recent days, so the brook was full, but the water was so turbid that the stream bed was not even visible. The mossy banks which are normally a vivid green, were coated in a layer of reddish-brown silt. This place that always sparkled and vibrated with life looked frightfully dull and dead. Mountain Brook in distress dulled by silt and sediment. Concerned that the brook was in distress, I immediately called the local Inland Wetlands and Watercourses Commission. Already alerted by someone far downstream from our farm who also had noticed the alarming discoloration of normally pristine Salmon Brook, the commission had traced the silt to its upstream source -- a recently cleared wooded slope with inadequately built sedimentation ponds. The offending landowner promptly engaged remediation experts to stabilize the slope and to shore-up the sedimentation ponds. Additionally, significant deposits of sediment in the affected wetlands were carefully removed to mitigate damage to this sensitive habitat using special equipment and manual labor. Though relieved that corrective actions were underway, I worried that the damage had been done and I would never again see the brook as it had been. A consulting hydrologist and soil scientist retained by the upstream property owner came to our farm to evaluate the impact on downstream neighbors. Though the water was running clearer than it had several weeks earlier, the stream bed and banks still were coated by a layer of fine, red silt. The slightest disturbance of the stream bed caused the water to cloud. Deeper pools of water remained opaque, with the fine silt particles held in suspension. The expert explained that unlike the situation at the source, these downstream deposits of silt were not enough to warrant human intervention. Attempts to remove the sediment would likely cause more harm than benefit. He said heavy rains and the high waters of spring would wash the silt out of Mountain Brook. These particles would travel through larger and larger waterways until they were eventually deposited as sediment in Long Island Sound. The best course of action was to do nothing; to give the situation time and let nature take its course. He was right! I watched the brook through the late fall and winter and have been delighted to see Mountain Brook returned to a pristine state. Winter snow and spring rains returned Mountain Brook to it pristine state. Nature’s ability to heal from trauma reminds me of how miraculous our natural world is. 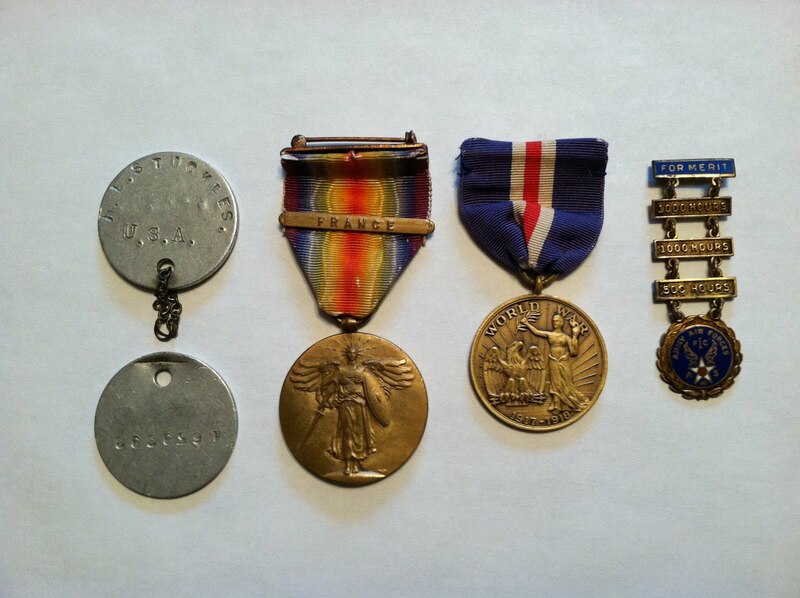 The restoration of this one, small jewel gives me hope for the future. Although our environment's natural resiliency struggles to survive in our human wake, it is not too late to reverse the harms we have inflicted on the planet. Spring is the season of rebirth, renewal, and new beginnings. Let's all do our part. We must commit to keeping our environment clean and livable. 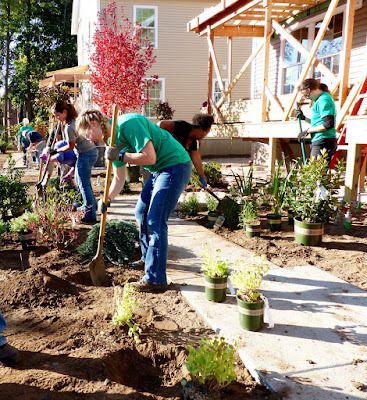 When added together even small, individual actions, such as buying local food, picking up litter, or planting a tree make a collective, positive impact. "For the beauty of the earth, For the beauty of the skies..." -- let's sing it; let's do it! Ann Wilhelm is a Research Analyst in the University of Connecticut’s Office of Institutional Research and Effectiveness. As part-time farmers and advocates for small-scale agricultural systems, Ann and her husband, Bill Bentley, are implementing several agroforestry systems on their North Granby, CT farm.